Ceratotherium simum (White rhino), Dicerus bicornis (Black Rhino), Rhinoceros unicornis (Indian rhino) and Dicerorhinus sumatrensis (Sumatran rhino) belong to the same family, just as humans, orang-utans, gorillas and chimpanzees belong to the same family but belong to different genera. We would not presume that the same techniques should be used to promote breeding in all four ape species. Or that what was true in 1980s is the same as in 2015. Or that what is true in Kenya (for example) is true in Malaysia (for example). So there is no reason to treat rhinos as one big homogeneous type of animal with the same issues globally. Each species is different. The Sumatran rhino is the most different of all: it is about to go extinct … not primarily as a result of poaching but primarily because there are not enough births … and this has been the main problem for many decades. Certainly, we cannot discount poaching. But there is no point in putting most of our efforts into preventing poaching if we are not putting even greater efforts into making more Sumatran rhino babies. You would think that that is common sense. There is a misconception that more data are needed on wild Sumatran rhinos in order to imagine the best way to save the species from extinction. It does not matter if there are 37 or 57 or 127 Sumatran rhinos remaining (except that, if there are indeed “more studies”, those who think there might be more than 100 Sumatran rhinos are surely in for a nasty surprise. Every effort to estimate Sumatran rhino numbers in the wild after 1980 has resulted in wildly optimistic over-estimates). To those who wish to deploy camera traps and get faeces to analyse for DNA: “Doing that will not give us any data of use in deciding on policy”. For a solitary and extremely rare animal (in most places where cameras are set, there will be only 0, 1 or 2 rhinos) there is NO way to estimate numbers in the wild. And even if someone does produce an estimate, we have no way of knowing of those individuals are fully fertile or if they are involved in breeding. The points to bear in mind are: the number of Sumatran rhinos left is getting close to zero; the number that are fertile adults ready to breed is almost zero; the species WILL go extinct if ways are not found and IMPLEMENTED to boost the birth rate above that we have seen since 1980. 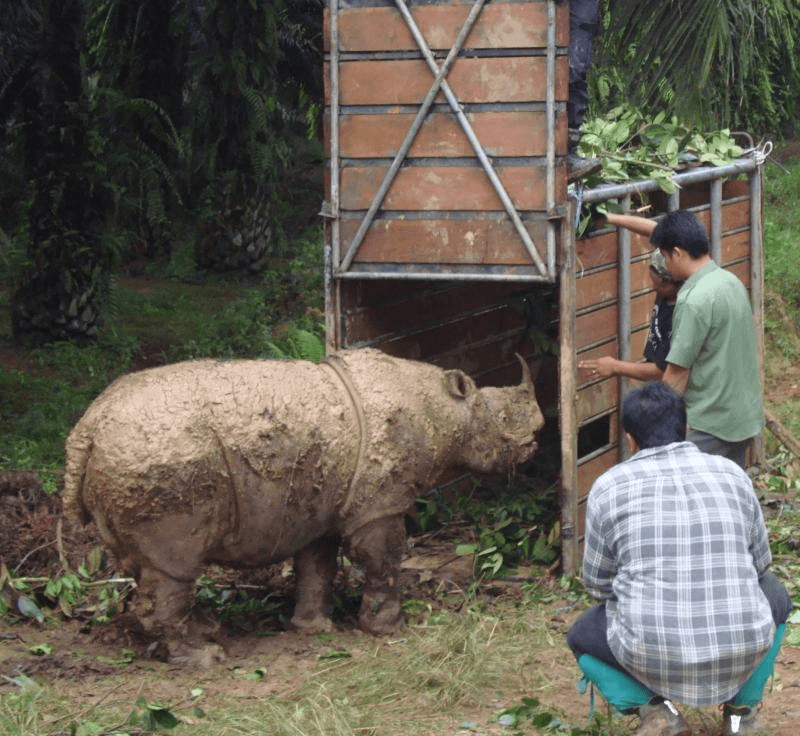 Those points apply to both wild Sumatran rhinos and to the nine in captive conditions. The difference between the wild and captive rhinos, however, is profound: we have no idea at all of the actual numbers, fertility, relatedness or frequency of mating (if any) of any wild rhinos. But with the -existence of a single collaborative programme – every rhino in fenced, managed conditions – can contribute to the goal of producing more babies. Even rhinos that cannot breed naturally can contribute. In Sabah, sperm and eggs have been harvested successfully from Sumatran rhinos that otherwise would have no hope of contributing to production of babies. We in BORA agree that in vitro fertilization is NOT the solution for saving almost any other species from extinction. In fact, it is irrelevant and not even part of the solution for almost all species. But the Sumatran rhino is different. Every possible method known to man has to be used to produce more baby rhinos. Successful in vitro fertilization leading to embryo production is not unknown to man.